UML - What is a Model? UML - What is UML? UML (Unified Modeling Language) is a standard language for specifying, visualizing, constructing, and documenting the artifacts of software systems. UML was created by the Object Management Group (OMG) and UML 1.0 specification draft was proposed to the OMG in January 1997. It was initially started to capture the behavior of complex software and non-software system and now it has become an OMG standard. This tutorial gives a basic and introductory understanding on UML. This tutorial has been prepared for beginners to help them understand the fundamentals of UML. After completing this tutorial you will find yourself at a moderate level of expertise from where you can take yourself to the next levels. Prof. Arnab Chakraborty is a Calcutta University alumnus with B.Sc. in Physics Hons with Gold medalist, B. Tech and M. Tech in Computer Science and Engineering has twenty-three+ years of academic teaching experience in different universities, colleges and eleven+ years of corporate training experiences for 150+ companies and trained 50,000+ professionals. He has also completed MBA from Vidyasagar University with dual specialization in Human Resource Management and Marketing Management. 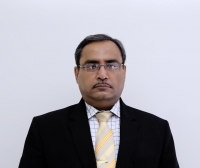 He is NLP and PMP trained, Global DMAIC Six Sigma Master Black Belt certified by IQF, USA. He is certified by ISA, USA on "Control and Automation System". He is also Global ITIL V3 Foundation certified as awarded by APMG, UK. Qualified for Accredited Management Teacher by AIMA. He is also empaneled trainer for HP, Accenture, IBM etc.